Blu Ripples Academic and Career Guide (Plan) is a unique comprehensive career planning and development report that provides clients with academic, career and employment guidance, insights and strategies into their preferred occupation of choice. 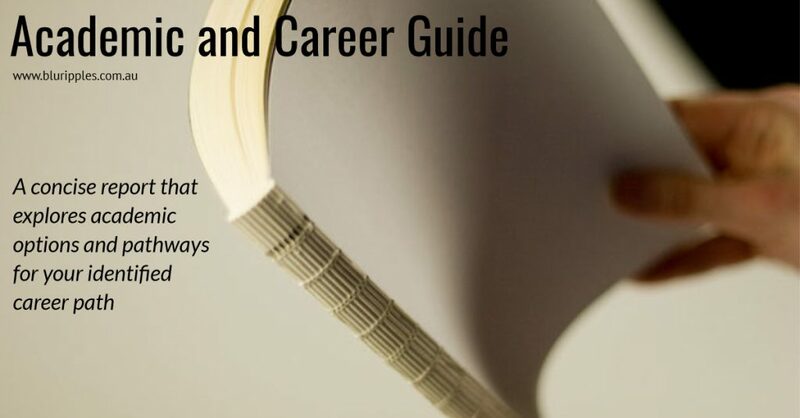 Our Academic and Career Guide can be purchased as either a stand-alone product for clients whom have identified their occupation of preference by themselves prior to meeting with Blu Ripples; or as a follow-on product for interested clients who have completed our Career Development Report process and wish to explore in greater detail the one clear career pathway that they wish to pursue. Blu Ripples Academic and Career Guide process consists of two quality interactive career development consultations. For new clients Blu Ripples will work with you on a one on one basis, over two career development sessions and talk to you about your preferred occupation, establish baselines, administer and analyse your preferred learning style. Whereas existing clients whom have previously completed the Career Development Report process with us; Blu Ripples will schedule a brief one on one follow up career development session with you to touch base, gather new relevant information, answer any queries you may have and discover your final career selection. Upon completion of the first career development session Blu Ripples will spend approximately 10-20 hours gathering, analysing and preparing the career, academic and employment information prior to producing and presenting our Academic and Occupational Guide to you in our second session. Drawing on her professional experiences and knowledge Katherine pioneered Blu Ripples Academic and Career Guide in 2017 after identifying a need in both her practice and the marketplace. Katherine is committed to continually and systematically evolving the Academic and Career Guide to ensure its relevance to her clients.